Act One of the Melges 20 World League in Forio D’Ischia served as the debut event for the new North Sails Mi-2 3Di RAW mainsail. With 5-11 knots of wind across the weekend, the new mainsail proved fast and powerful in the exact conditions it was designed for and Filippo Pacinotti’s Brontolo Racing, powered by the new Mi-2 mainsail, played the light winds to their advantage, finishing the weekend with an impressive 1-2-(3)-1-1-3, giving them a massive 12 points advantage over the second placed boat. The new Mi-2 3Di RAW Mainsail is an upgrade of the first 3Di mainsail for the Melges 20 class. The design has been refined to be more forgiving in the lighter wind but without compromising its heavy wind performance. Using the North Sails Suite our designers made changes to both the mold shape and the 3Di tape layouts. The Mi-2 better matches the flying shape of the World Championship winning Mi-16 3DL mainsail. « It was a great weekend for North clients! North boats won five out of the six races and Filippo won the event with an incredible series of results. 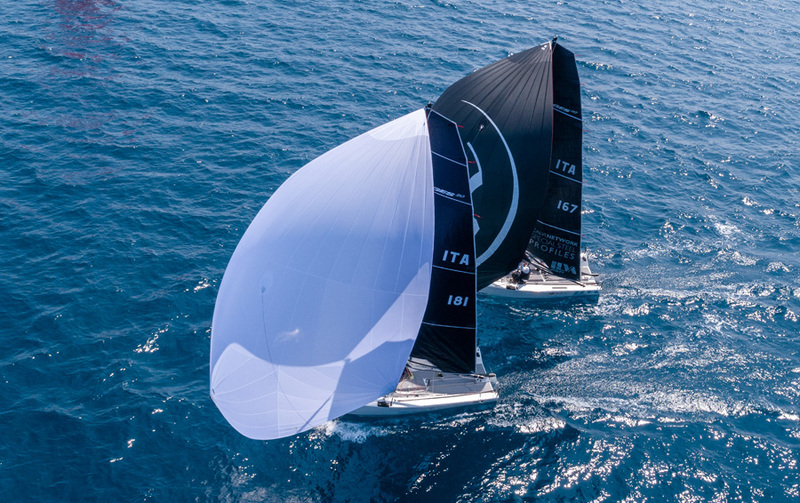 Their worst score was a third place!” said North Sails expert Giulio Desiderato. Click here to find out more about our Melges 20 products and the shop the winning Mi-2 design.